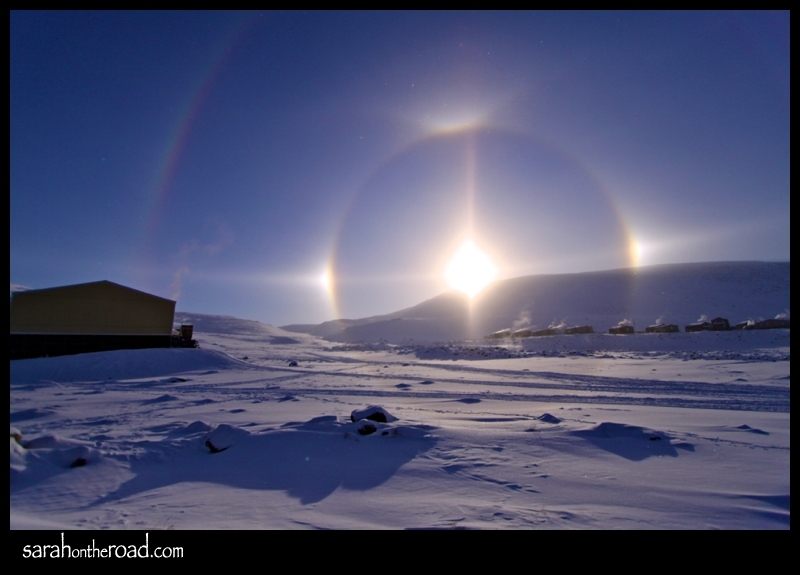 Another month gone in 2013…has anyone else noticed how fast the days seemed to go in February? Don’t get me wrong, I’m loving the fact that it’s getting a bit more light each day. 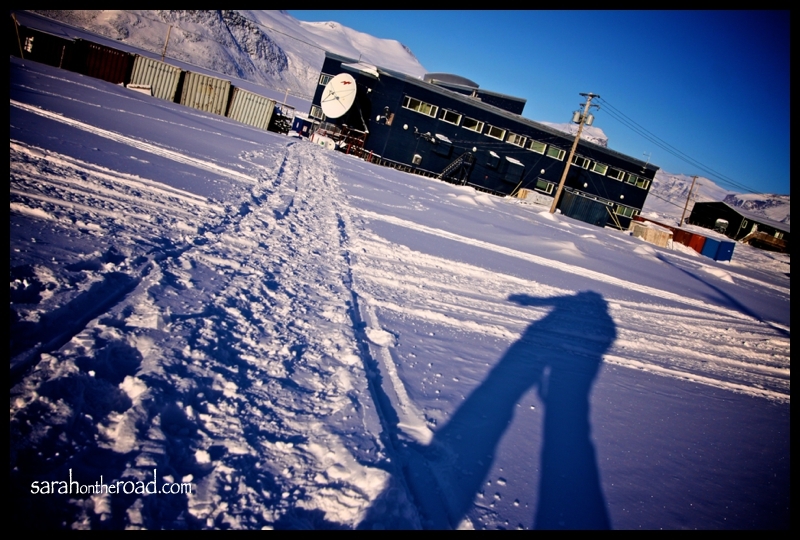 The temperatures are sunny but cold…but it’s warmed up to the -20Cs so that’s been amazing. But it time just seems to be flying past so quickly! This month there were a few challenges I had. There seemed to be a few days my creative mojo was gone… so I didn’t post anything. But then decided I should push on and catch up. 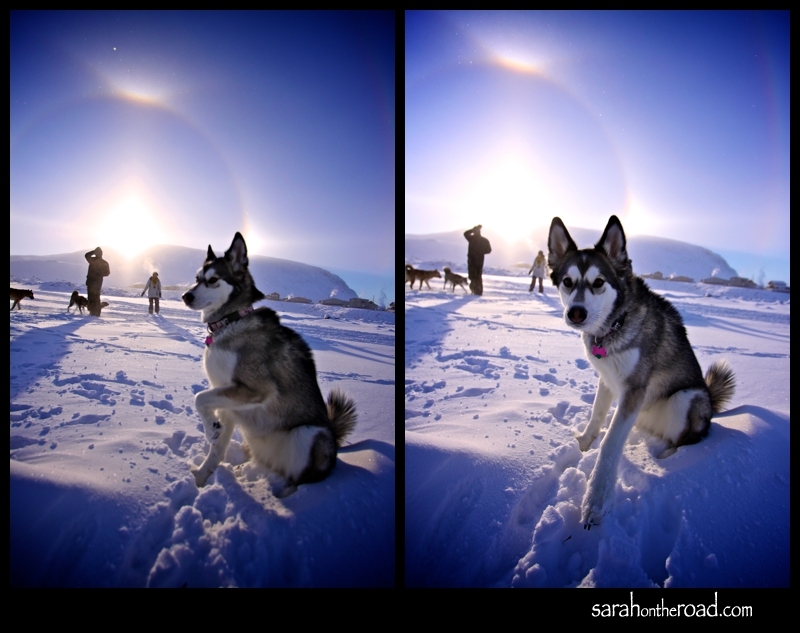 As always I post my photos regularly on Instagram (@sarahontheroad). 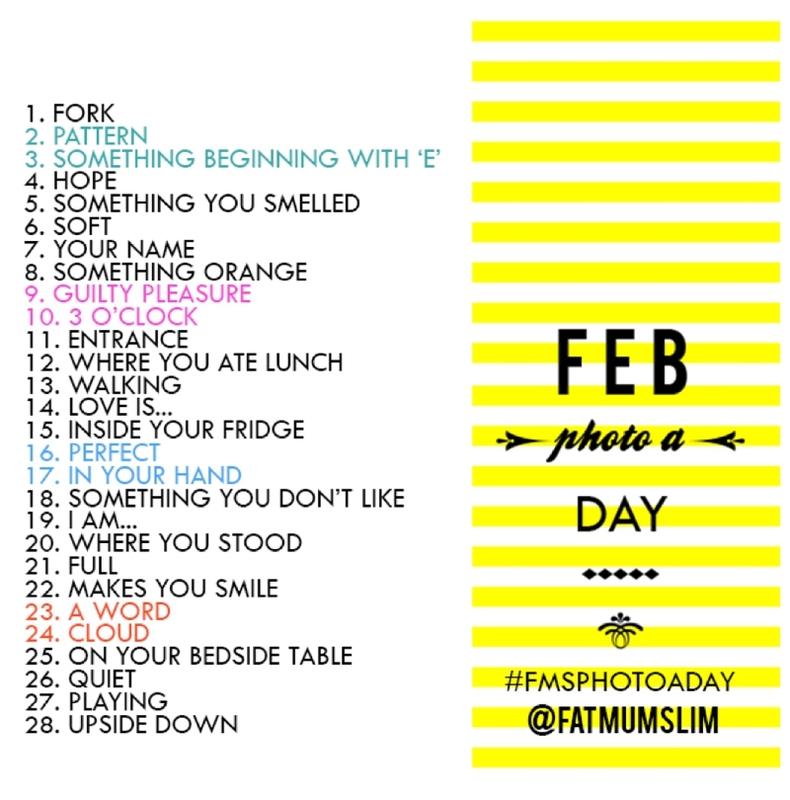 Thanks again Fat Mum Slim for creating the prompts for the photo-a-day challenge! Day 1. Fork… I was stuck inside a hotel room in Iqaluit during a blizzard. I felt kind of uncreative, and bored…so that’s what I came up with! Day 2. Pattern…After the blizzard settled down, I grabbed my Canon 50D and went outside to take this shot. 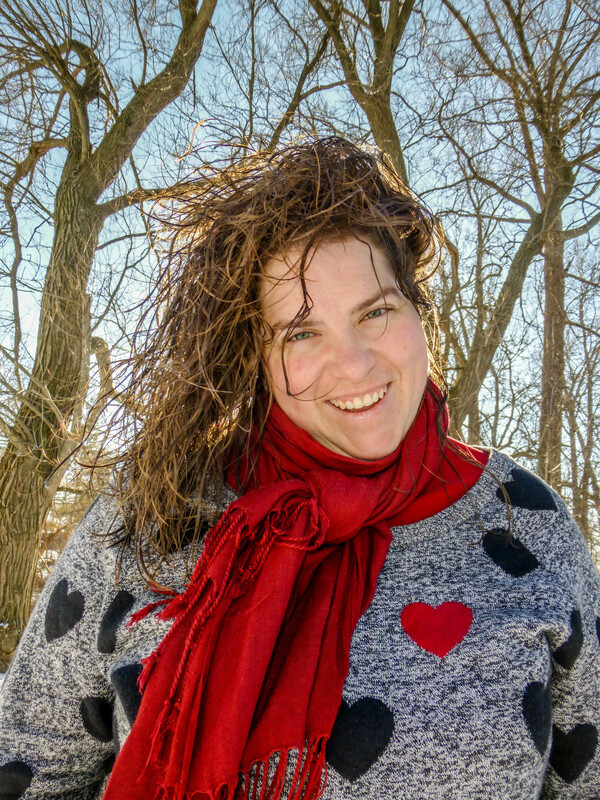 It was crazy windy still…but nice to get some fresh air. Day 3. 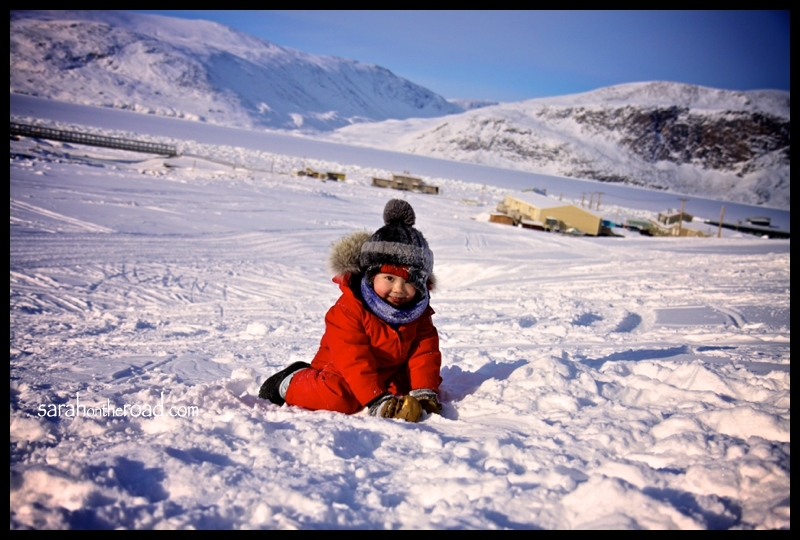 Something beginning with ‘E’… I got home from my trip to Iqaluit after 2 weeks away, all I had in my fridge was 2 eggs and some egg shells! Day 4. Hope… It was a Monday morning and I had ‘hoped’ I could have stayed in my own bed longer! Day 5. Something you smelled… I made some homemade broccoli soup, it smelt so good! Day 6. Soft… This little polar bear sits on the shelf by my desk. He and his mittens are pretty soft! Day 7. Your name… This was a photo of my name tag from the meetings I was at the week before. My name is in Inuktitut syllabics at the top of the sticker! Day 8. Something orange… This is a seacan I pass on my way to work…it’s orangey-red but was close enough to orange for me! Day 9. Guilty pleasure… I still have a bucket of Halloween candy in my sealift room! It’s the left overs that a friend send me from the states! Day 10. 3 O’Clock… It was 3 O’Clock on a Sunday, I was making a lasagne for the Hawaiian Themed Pot-Luck I went to that night! Day 11. Entrance… This is my back door to my house, on the inside…it’s a wee bit frosty! Day 12. Where you ate lunch… Every day I get to come home for lunch, so get to eat at my kitchen table as I listen to Pang Community Radio! Day 13. Walking… The sun started to SHINE over the hills. This was a snap on my way home from work one day at lunch! Day 15. Inside your fridge… My fridge looks so organized with my ‘tupperware fridge smart’ containers…helps keep my produce stuff fresh a bit longer! Day 16. Perfect… It was a perfect Saturday. The sun shone all day. I took this photo with my Canon 50D on a walk behind my house. Day 17. In your hand… Here are three of my favourite broaches. I was excited that my narwhal and polar bear were repaired by a local jewelry maker! Day 18. Something you don’t like… This week it was dishes. I might have let the pile up all week, seriously I need to get on top of this habit of not doing dishes regularly! Day 20. Where I stood… This photo was taken with my iPhone before lunch. 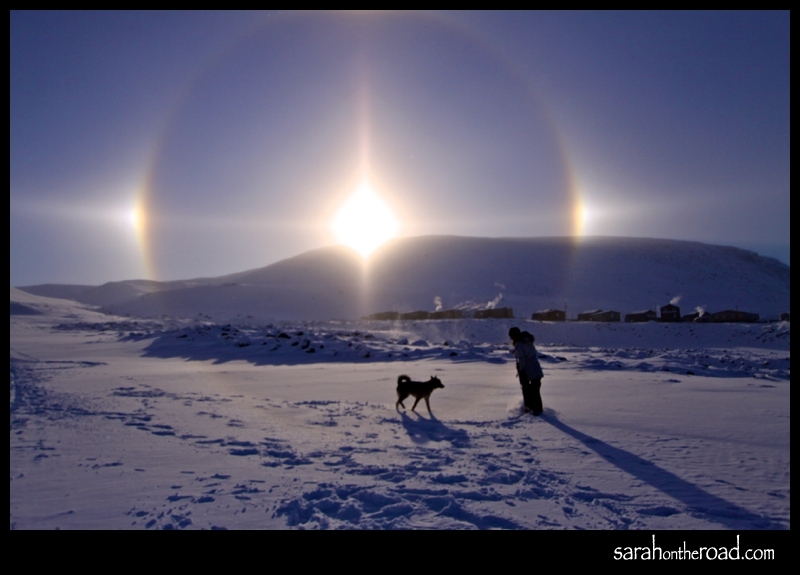 I was waiting at the gas station and jumped out to take a photo of this awesome Sun-dog. 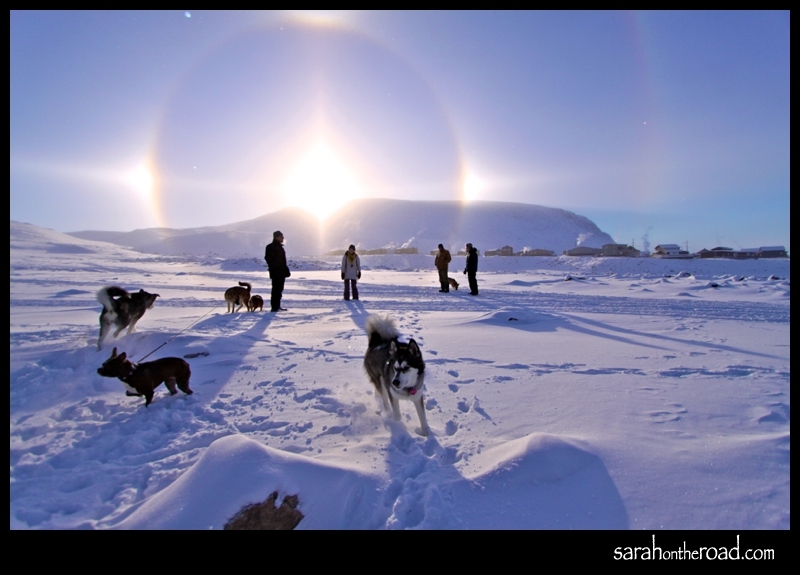 At lunch I took some more photos… of the sun-dog from behind my house. Day 21. Full… I have a crazy cupboard FULL of tea. No coffee in this house, but tea? I have enough for years of tea parties! Day 23. A word… I love playing Words with Friends! Ended up playing a 30point word “Quire” in this game! Day 25. On your beside table… I had a fever, so was home sick from work that’s why the thermometre, advil and water were on my bedside table! Day 26. Quiet… I was still feeling sick, so I had a quiet day at home. In the afternoon I went to sleep on the couch for a bit. Day 27. Playing… Songza is one of my favourite apps to play music! Have you tried it? It’s a fun online dj…check it out! Day 28. Upside down… Seems like all my cups in the cupboard were upside down! Yahoo another month down, that’s 2 months done…only 10 to go! 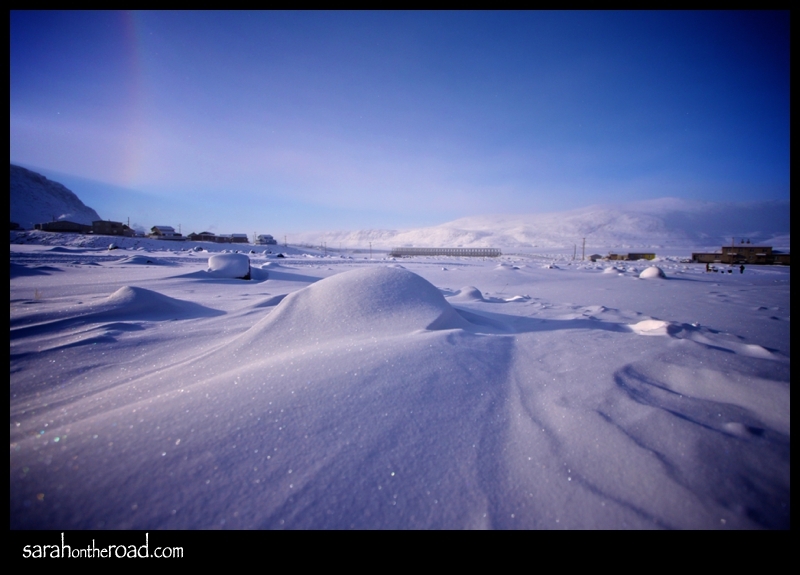 If you want to see my January Photo-A-Day Photos click HERE! So even though February at time wasn’t that easy…I got through another month. I’m looking forward to March. There is starting to get more light after work…so hopefully this will help with my creativity with this month’s photos. 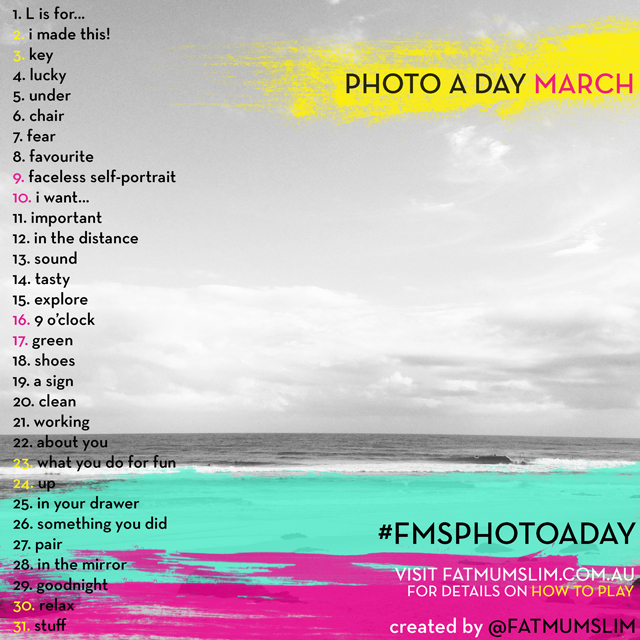 If you want to play along, send me a comment and let me know where you are posting your photos! 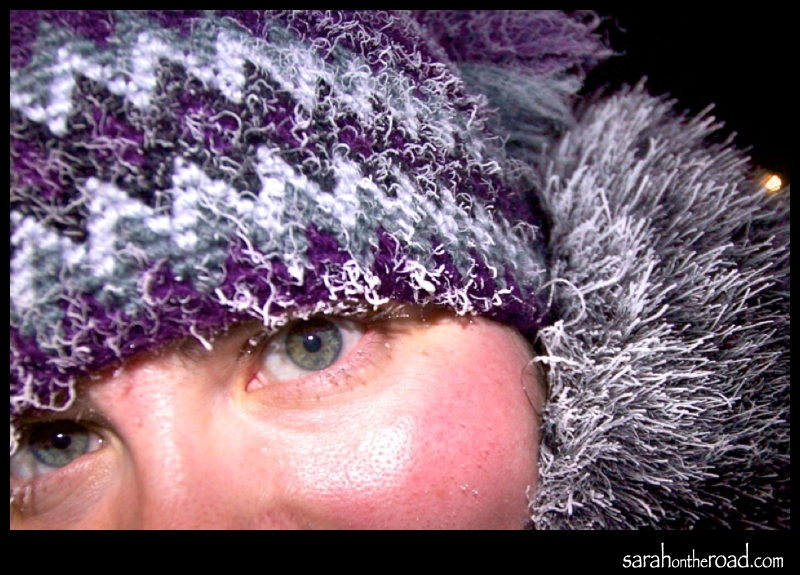 This entry was posted in Photo-a-DAY-Challenge on February 28, 2013 by Sarah on the Road. 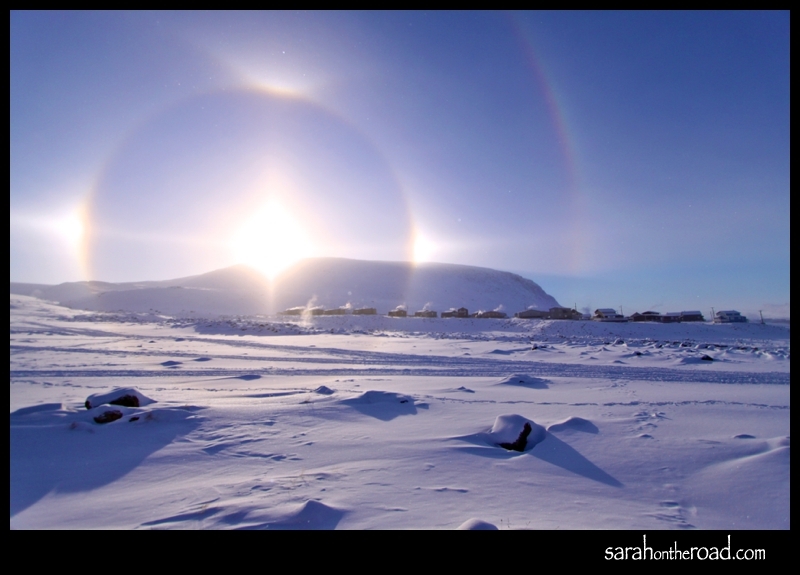 This entry was posted in Wordless Wednesday on February 27, 2013 by Sarah on the Road. 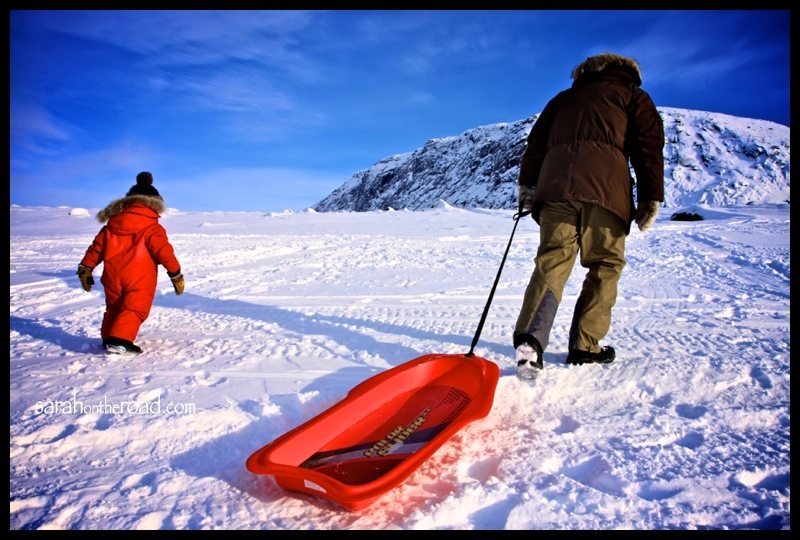 I called my neighbours to see if they wanted to go sledding…Ryan was heading out with his son…so I tagged along. 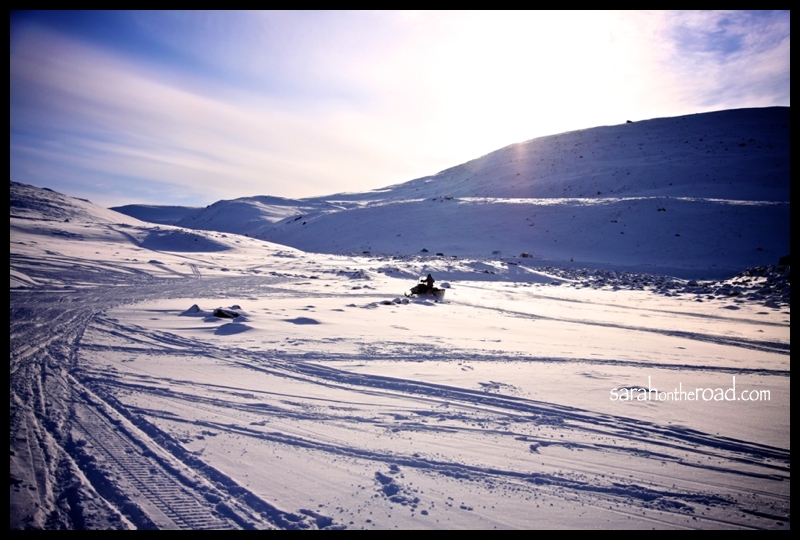 We just walked up the snowmobile ‘highway’ behind our house… to just below the hill from the water reservoir. 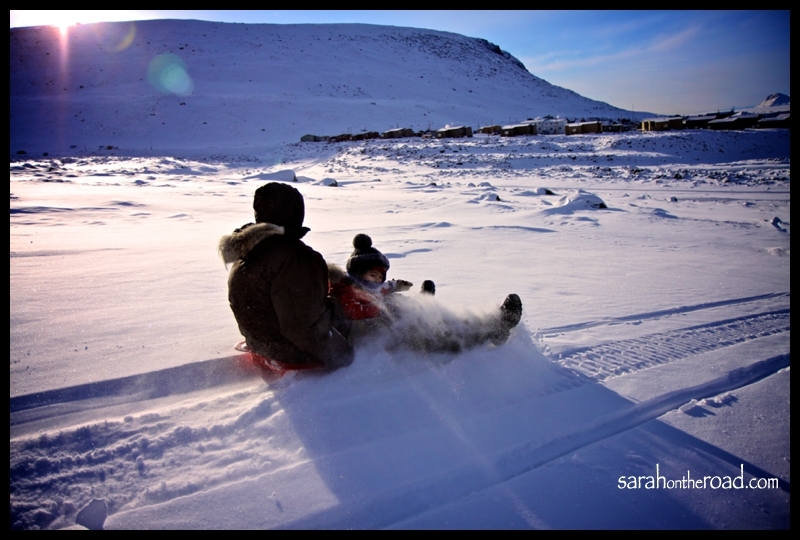 Then the sledding began! 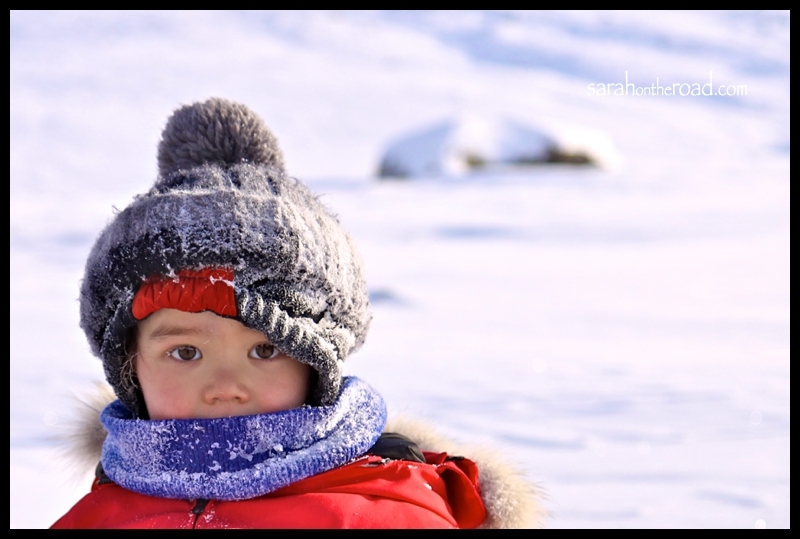 Marton is 3…and had a blast. 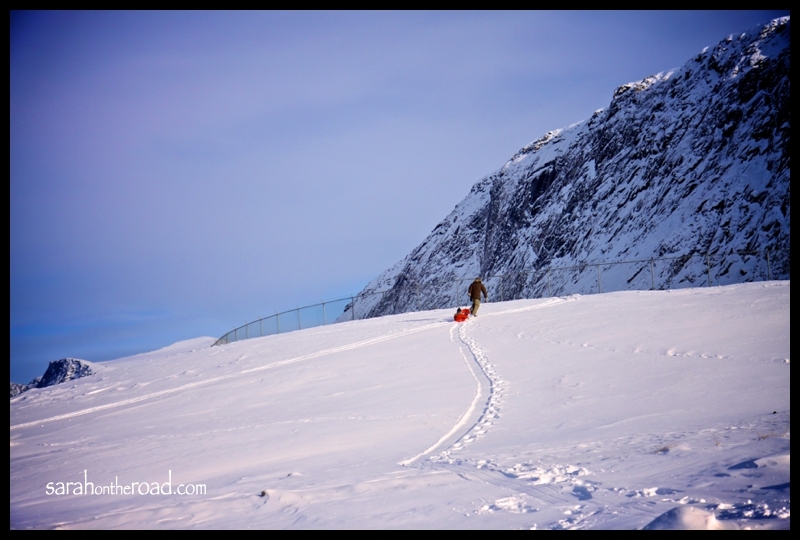 At the end of each run, he promptly get on his feet and say again! 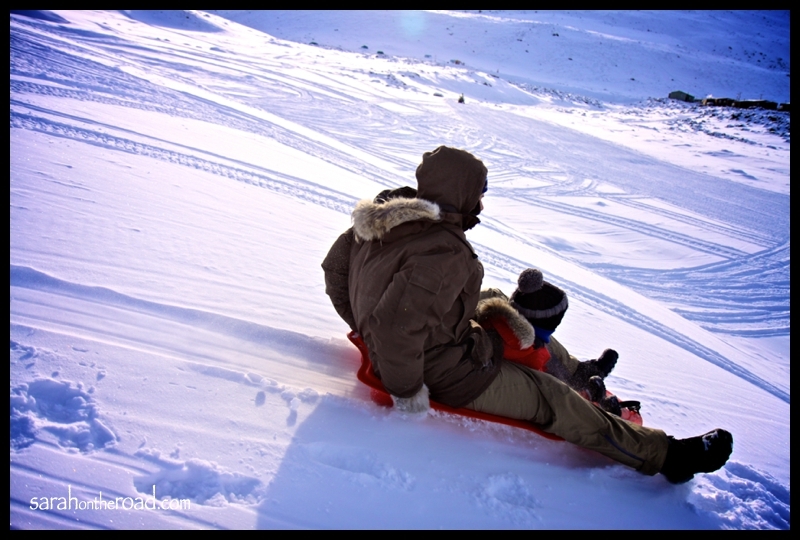 Ryan and I took turns climbing to the top of the hill and sledding down with him. 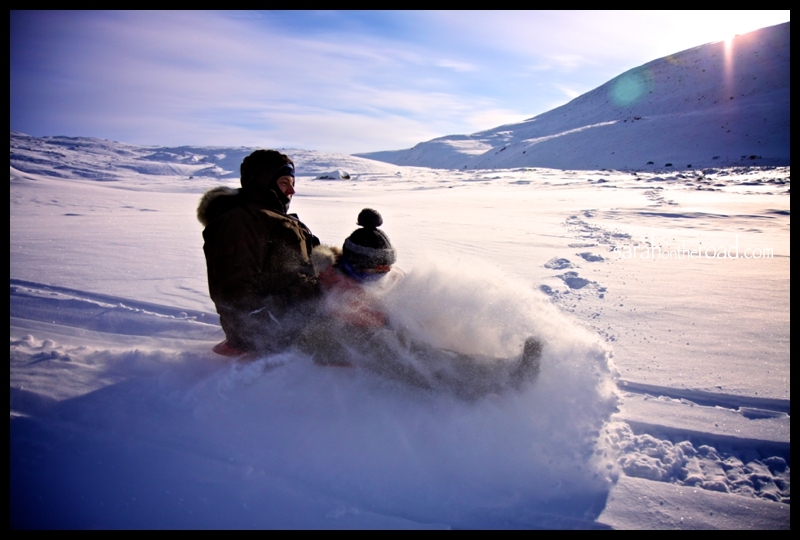 Ryan and Marton went first… I LOVE this photo of them climbing up to the top of the hill, it’s one of my favourites from the day! 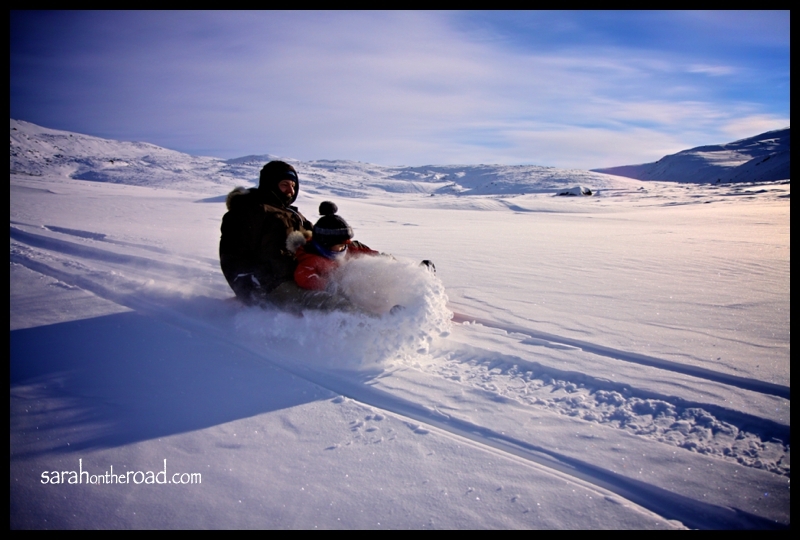 Then for the ‘last’ long sled…Ryan and Marton went to the top of the BIG hill… (to the fence of the water reservoir) to attempt to sled down the WHOLE hill following a snowmobile track! 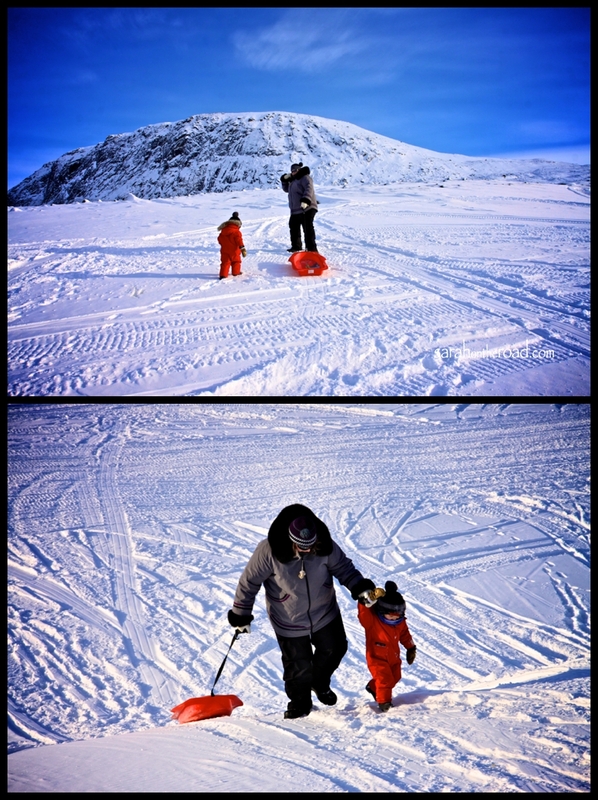 Then here is their progress down the hill…. 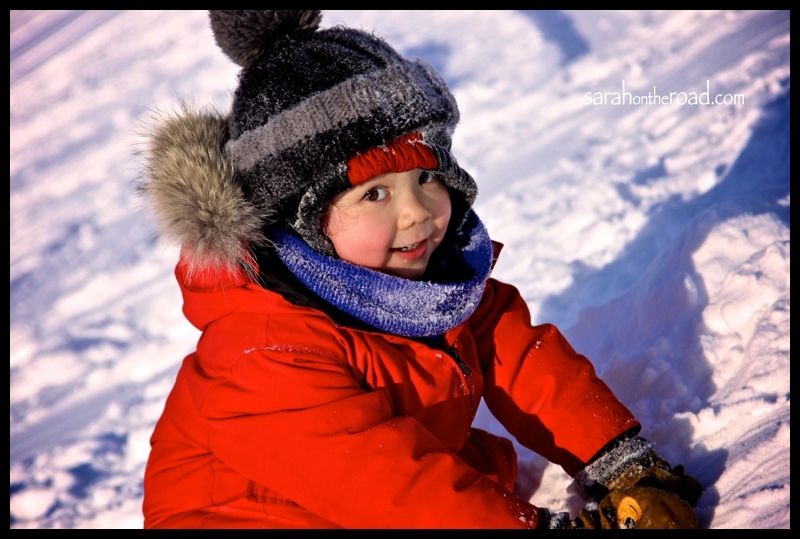 It was such a fun delightful way to spend some time outside. Thanks for a fun afternoon Ryan and Marton. 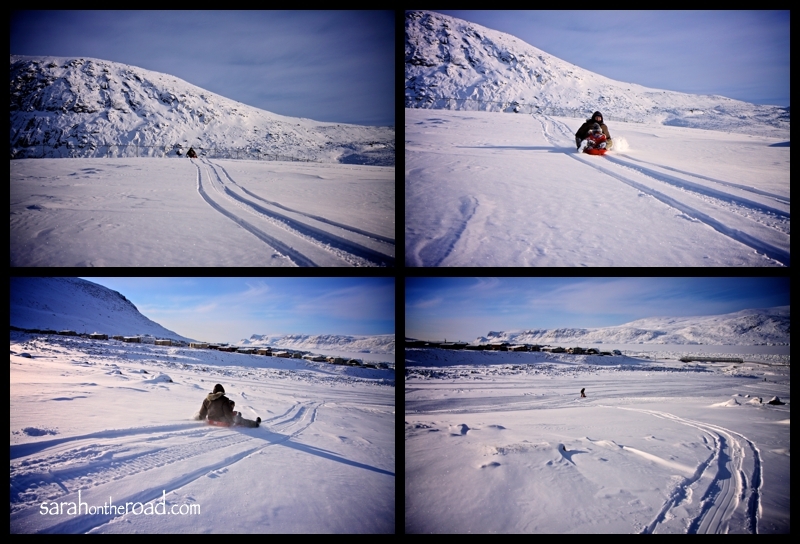 Next time I need to take one of my own sleds (I forgot it at home this trip…) and Maki needs to come too!!! Two things that are making me happy: being able to wear my sunglasses again and seeing my shadow! 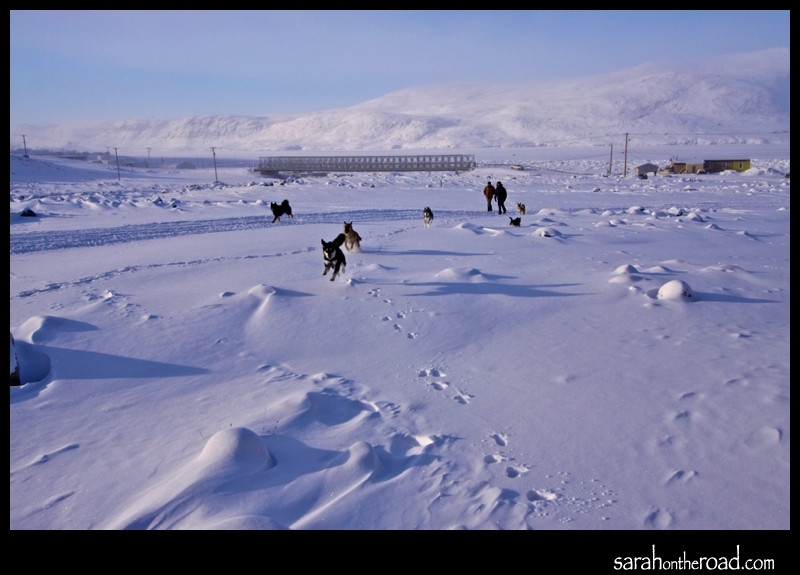 This entry was posted in Life in Nunavut, Walk in the 'hood and tagged Pangnirtung on February 25, 2013 by Sarah on the Road. 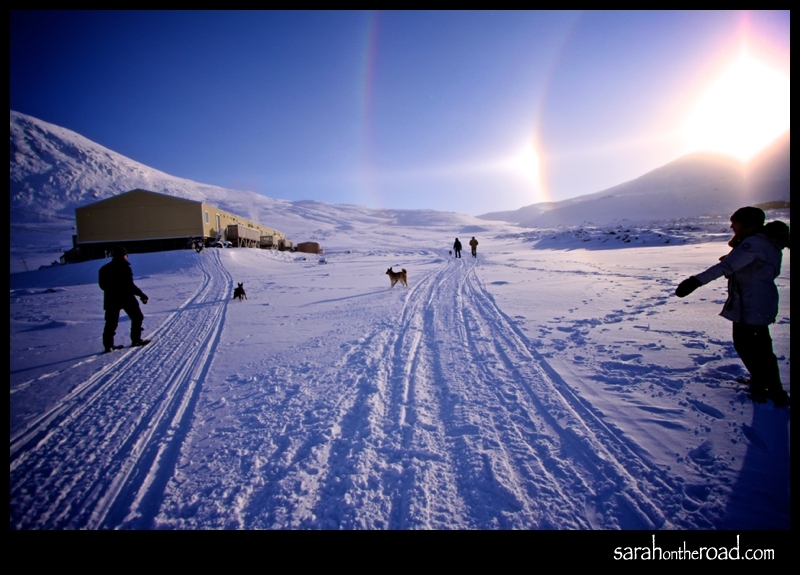 Behind my house is a ‘snowmobile’ highway…it’s a perfect place to walk dogs. So lots of my friends were doing this very thing at the beinging of my lunch break! So ended up taking a few shots of them as well. 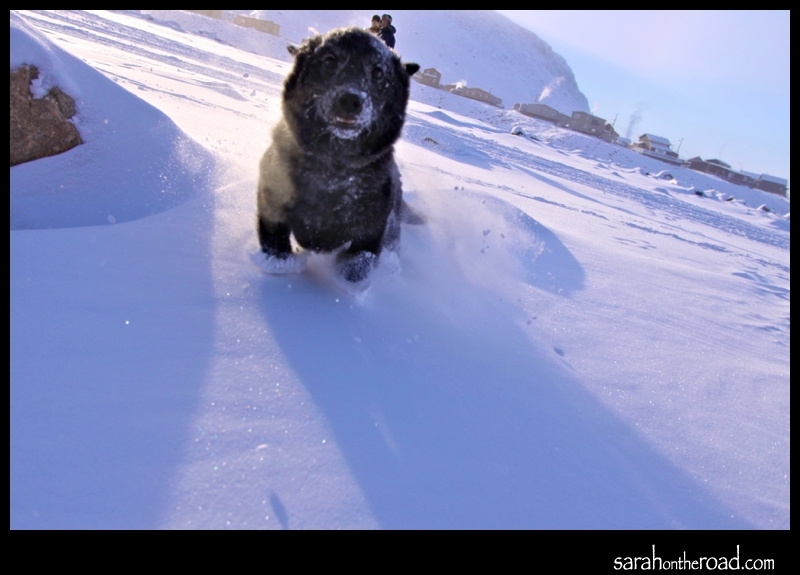 Of course these dogs were happy to be running free…whether they had long legs or short legs! 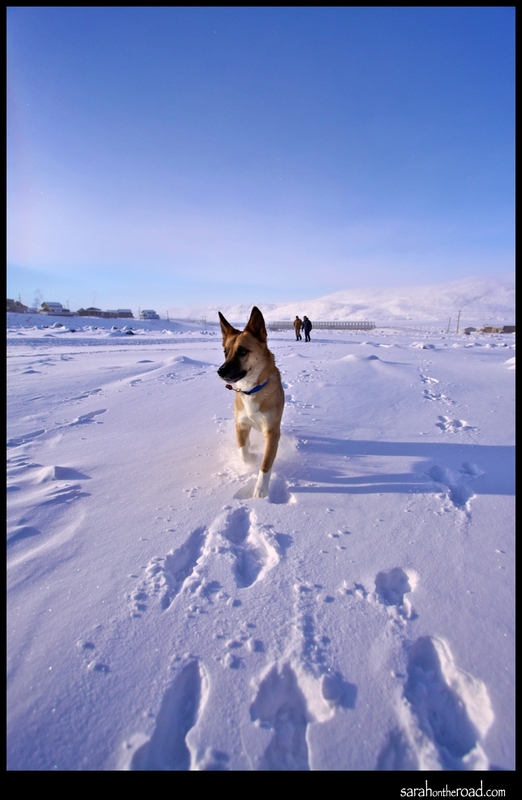 These dogs loved running in the sunshine. 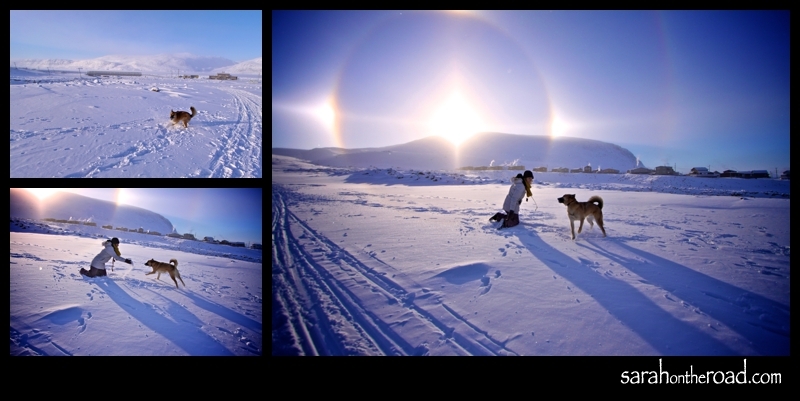 Sun + dogs = sundogs …that’s an ok math equation right? 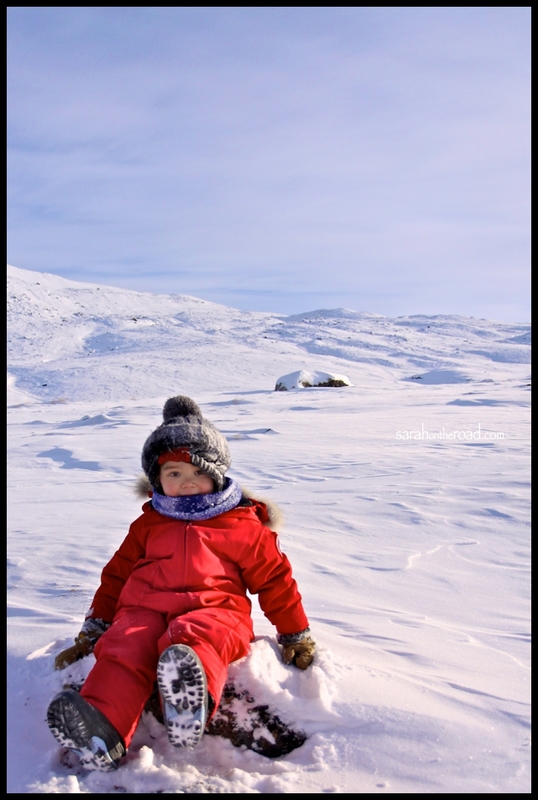 Sitting pretty in the -31C (-37C with the windchill)…. did seem to bother this beauty! Soon it was time to back to the party…and finish their lunch run! Watching these dogs play in the sunshine almost made me wished I had dog. But in reality…I’m not sure that would be a good idea. I’m not a great dog person…but love and appreciate other’s dogs. But big dogs scare me. The other reason is that it’s hard to find dog-sitters and I do move around quite a bit! So I suppose when I need a dog fix, I can go find a friend’s dog and go for a walk! Days like yesterday make me smile…Happy Thursday…. hope you have a fantastic day! 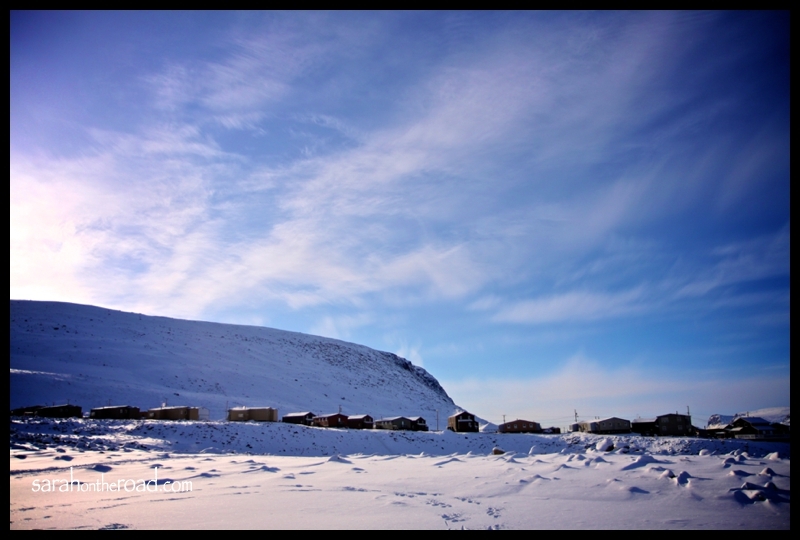 This entry was posted in Life in Nunavut, Walk in the 'hood and tagged Pangnirtung on February 21, 2013 by Sarah on the Road. 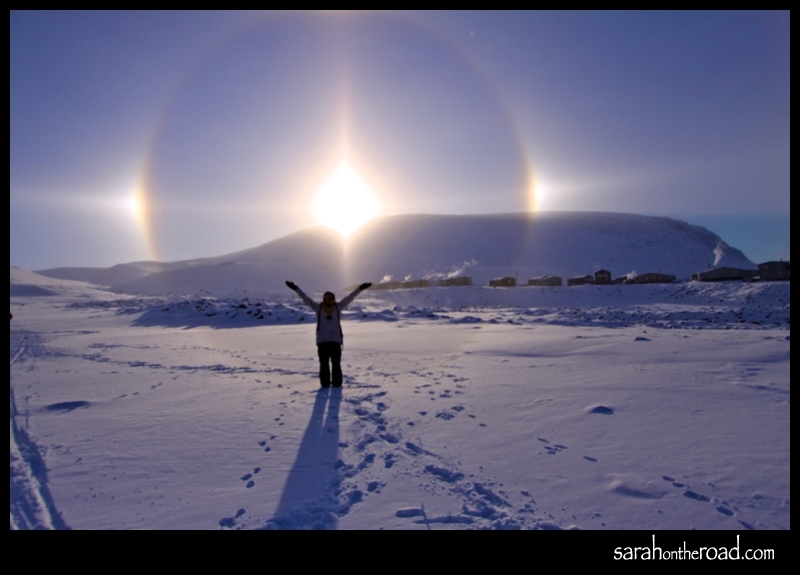 This entry was posted in Wordless Wednesday on February 20, 2013 by Sarah on the Road.